3. Storage Container Professionals are on Your Side: Finally, with a rental truck, getting your loaded truck to your destination is your responsibility. You are under the gun to get to your destination, unload the truck and get it back to the rental store before you get charged for another day. With a rental truck, time is money. On top of the stress of moving, now you are dealing with traffic, driving a vehicle you are not familiar or comfortable with, and the logistics of the move. The mobile storage container move is a much different scenario. The mobile storage company delivers the storage container to your home, you load it at your convenience and pace, call them to pick it up when loaded, and they deliver it to your new destination when you need it. A professional is handling the pick-up and delivery of your possessions and dealing with the vehicle, traffic, and logistics of your move. And, as an added bonus, they can even store your goods if needed. 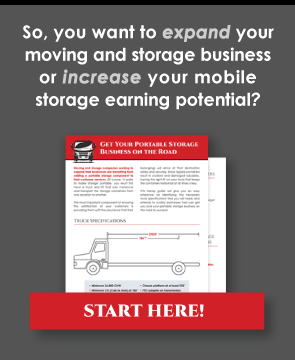 Are you considering opening a portable storage business? Our patented storage container lifting system can be attached to any portable storage container, which makes moving storage containers that much easier—and safer for the items inside. Are you interested in learning more about Horizontal Lift? Contact us today!